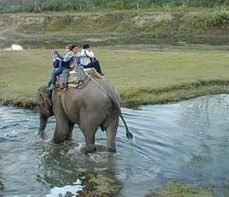 Chitwan National Park stands today as a successful testimony of nature co nservation in South Asia. This is the first national park of Nepal established in 1973 to preserve a unique ecosystem significantly valuable to the whole world. The park covering a pristine area of 932 sq. km is situated in the subtropical inner Terai lowlands of southern central part of Nepal. The park has gained much wider recognition in the world when UNESCO included this area on the list of World Heritage Site in 1984. The park consists of churia hills, ox-bow lakes, flood plains of Rapti, Reu and Narayani rivers. The Churia hill rises gradually towards the east from 150 m to over 800 m. The lower but most rugged Someshwor hills occupy most of the western portion of the park. The flood plains of Chitwan are rich alluvial. The park boundaries have been delineated by the Narayani and Rapti rivers in the north and west, and the Reu river and Someshwor hills in the south and south-west. It shares its eastern border with Parsa Wildlife Reserve. There are more than 43 species of mammals in the park. 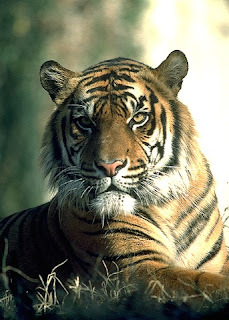 The park is especially renowned for its protection of the endangered one- horned rhinoceros, tiger, and gharial crocodile along with many other common species of wild animal. 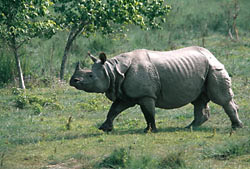 The estimated population of rhinos is 400. The park also secures population s of endangered species such as gaur, wild elephant, four horned antelope, striped hyena, pangolin, Gangetic dolphin, monitor lizard, and python. Some of the other animals found in the park are sambar, chital, hog deer, barking deer, sloth deer, common leopard, ratel, palm civet, wild dog, langur and rhesus monkeys. There are over 450 species of birds in the park. Among the endangered birds are the Bengal florican, giant hornbill, lesser florican, black stork and white stork. A few of the common birds seen are peafowl, red jungle fowl, and different species of egrets, herons, kingfishers, flycatchers and woodpeckers. The best times for bird watching are in March and December. More than 45 species of amphibians and reptiles are found in the park, some of which are the marsh mugger crocodile, cobra, green pit viper and various species of frogs and tortoises. The park is actively engaged in the scientific study of several species of wild flora and fauna. Lets save all the species we have and successfully run it!